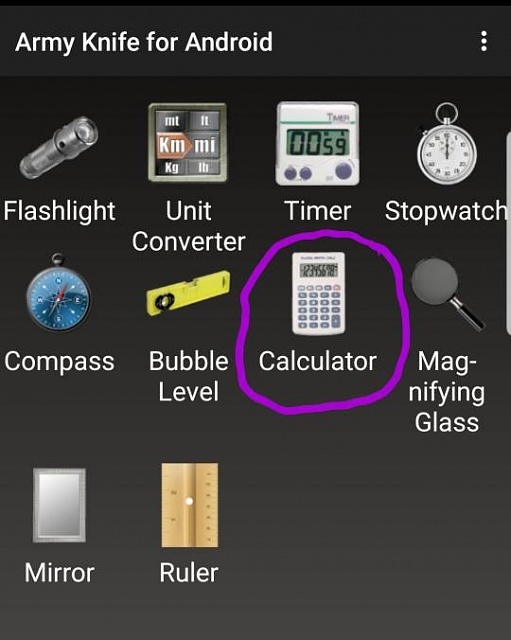 I looked in app drawer and found no calculator. How can a flagship phone lack something so basic? Even a flip phone has a calculator. Fit24 and mustang7757 like this. Did you try searching for it in the app drawer ? Check in the Samsung folder in app drawer? Did you try the search function in the app drawer? I cannot find a calculator so on my Note 9 that I didn't install. I looked in disabled apps, with none found, but I may have uninstalled the Samsung calculator if one existed, because I like this one. It's got different themes. My unlocked Note 9 from Samsung on Pie has the stock calculator. Did a search. The only one that comes up is the Google calculator I installed. I just find it odd that a phone didn't come with one by default. That is odd yours doesn't have it preinstalled. Mine has it. I have a tmobile, locked, 128gb version and I got a few weeks after launch at a tmobile. It should be available on the Google play store if you want it. silverfang77 and kevinpleasants like this. huh. Samsung calculator present from day 1 (verizon Note 9, locked). You probably uninstalled accidentally. Just reinstall. debdroid1a and sweetypie31 like this. It supports Dark Mode. It's a keeper. It does support dark mode.. 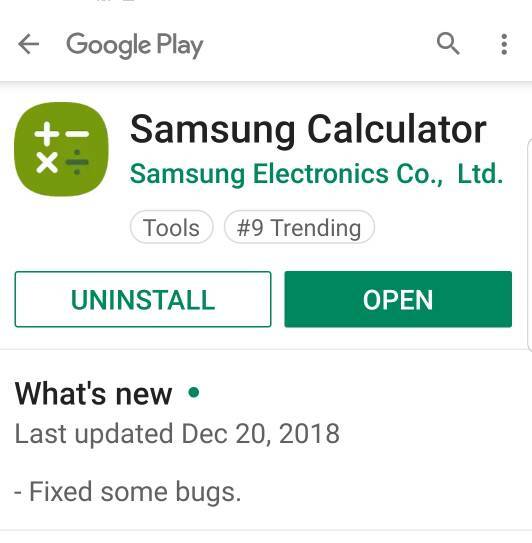 So people complain about Samsung bloat but are now upset that there's no calaculator app pre-installed? I'm kidding. Manson79, debdroid1a, pizza_pablo and 1 others like this. And when there are so many apps to choose from. Even my Army Knife app has a calculator. Lol that's so true ..
Love the army knife app! I'll just use that instead. mustang7757, Mike Dee and debdroid1a like this. I just use the calculator in the Edge panel. Also I just did a search in my apps for "Calc" and one came right up. It should be stock and should be there. The Edge Panel calculator is gone too. if you want you can always download it from the play store and have it back. Hmm I have it on mine. Did you go into Edge Panel settings? For the phone, did you go into the Apps screen and just search "Calc" ? As most people have said, the Samsung Calculator app was installed by default on my phone. No "Messages" app on my wife's watch--am I right on why? No raise to call on note 9 on pie !!!!! !